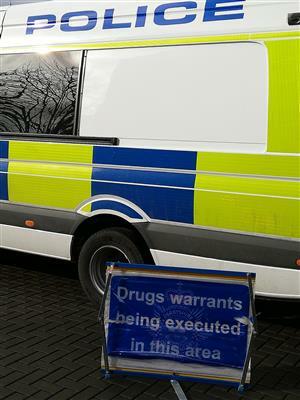 Thursday 7th February 2019 two simultaneous drugs warrants executed at New Delves Court, Heanor and Sunningdale Avenue, Heanor. A quantity of Cannabis and suspected Class A drugs have been seized from both addresses. Following the execution of these warrants a 36-year-old male has been arrested on suspicion of producing a controlled drug and a shop theft, a 42-year-old female has been arrested on suspicion of conspiring to supply a controlled drug, a 29-year-old male has been arrested on suspicion of conspiring to supply a controlled drug. Also found at one of the addresses was a 46-year-old male who has been arrested on suspicion of three separate shop thefts. Derbyshire Police and the Heanor and Langley Mill Safer Neighbourhood Team will not tolerate drug-related activity in our area. We record every report to us, so if you suspect someone of growing or dealing drugs, please report this to us by calling 101.